The 48-year-old comedian and actor is set to marry fellow actress Meredith Salenger, 47, their reps confirmed to E! News Thursday. 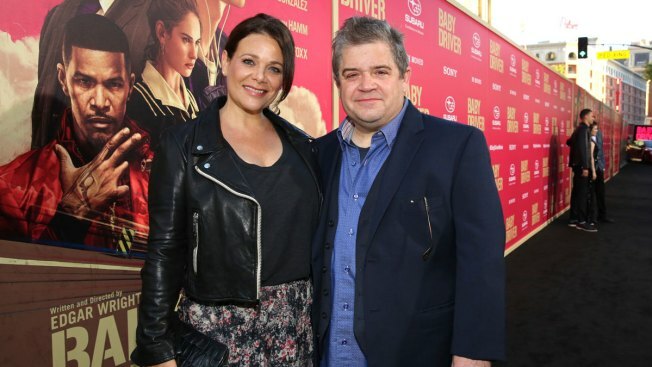 Patton Oswalt is engaged, some 15 months after the tragic death of his wife. Salenger posted on her Instagram page a selfie of her and Oswalt, with an image of Dwayne "The Rock" Johnson in his WWE pose photoshopped on her hand. "Don't wanna brag... but check out the size of The Rock on my finger! Hahahah (photoshop via@edwardderuiter)," she wrote. She then posted photos showing her real ring, which contains an emerald-cut diamond surrounded by tapered baguettes, and her embracing Oswalt and his 8-year-old daughter Alice. "It's official. I'm the luckiest happiest girl in the universe!!!! I love you @pattonoswalt I love you Alice Oswalt! #YesYesYes," Salenger wrote. Oswalt reposted the photos on his Twitter page. "I put the ring in a marzipan [Star Wars] Slave I replica and said, 'Will you be my Padawan of Love?' She maced me but said yes later," he joked. Salenger is known for roles in Disney's 1985 film "The Journey of Natty Gann" and the 1995 remake of "Village of the Damned." In recent years, she has voiced characters on the animated shows "Star Wars: The Clone Wars" and "Star Wars: Rebels." Salenger had on Wednesday posted a throwback photo of herself at a wedding, writing, "Once upon a time... in 2008... at my friend's wedding... I caught the bouquet... #fairytalesdoexist." Oswalt's wife Michelle McNamara, mother of their 8-year-old daughter Alice, died in her sleep in April 2016. He opened up about her death in touching online tributes. "Michelle brought me nothing but happiness," he wrote this past April, on the one-year anniversary of her passing. "One year in. Another year starting. It's awful, but it's not fatal."